Steve Gabriel curls back a bit of flimsy net fencing and shakes a plastic bucket of alfalfa pellets. Immediately, a sweet-faced, short-fleeced mob of some 50 Katahdin sheep pull away from a line of young black locust trees on whose leaves they’ve been snacking and swarm around him. The sheep race after Gabriel as he strides across nibbled grass and out from the fencing, around a dirt path’s shallow curve, and into a shadier, overgrown pasture dotted with longstanding black walnut and hawthorn trees. Gabriel is an agroforestry specialist at Cornell University’s Small Farms Program. He’s also the author of the book on silvopasture, a farming technique that’s touted as a way to sequester carbon by growing trees in livestock pastures. Trees absorb and sequester large amounts of carbon over time; they’re rendered even more powerful when they’re used in concert with grazing and planted on “marginal” land that isn’t great for growing crops—what Gabriel calls the “funky edges” around, say, healthy woodlands. On the heels of the latest, dire, National Climate Assessment, ag-based climate solutions such as silvopasture could provide much-needed climate benefits—if they can be scaled up. Project Drawdown, a group of international scientists and policymakers that modeled the 80 most effective ways to battle climate change, ranks silvopasture number nine on its list, reporting that it could reduce CO2 emissions by over 31 gigatons by 2050 if it were ramped up from its current 351 million acres to 554 million acres worldwide. There are no good estimates of how much land in the U.S. is currently devoted to silvopasture. The amount, though, is small, which means there’s potential for the practice to play much a larger role here; worldwide, it accounts for about 15 percent of all grazing land. This prompts the question: Can more American farmers get the message about silvopasture’s positive qualities, and can the resources necessary to get them started with it, or transition to it, be made more readily available? Gabriel addressed at least the first part of that question in his book. It’s a primer on ways to mingle silva (Latin for forest) with the pasturing of livestock—as well as a look at ancient silvopasture methods in Spain’s dehesa and Japan’s Kyushu province, plus more recent efforts in places like Mexico, where it receives government subsidies. The method has also been adopted in Panama, Costa Rica, and Colombia. Much of the knowledge Gabriel is passing on he’s accumulated through first-hand experience farming with his wife Elizabeth on their 35-acre operation outside Ithaca, New York. There, they’ve been fiddling with a system that works like this: The sheep, which the Gabriels raise for meat, rotate daily on one-acre grazing plots. On a couple of those plots, which contain seeded-in and naturally occurring grasses, they’ve planted those fast-growing black locust trees to provide shade (more and more necessary in a rapidly warming world) and some forage for the animals, as well as fix nitrogen and hold a whole lot of carbon in the soil—anywhere from 3 to 10 tons per hectare (roughly 2.5 acres) per year. Eventually, Steve Gabriel says he might chop the trees down for rot-resistant fence posts, which will fetch a high market price, even as they retain the carbon stored within their wood. In some of their woodsier plots, the sheep have nibbled down the underbrush. This creates areas suitable for their shelter and for seeding in new, more nutritious grass and forb forages; it’s also freed up wild apple trees the Gabriels harvest for local cider-makers. On the remaining, densely forested plots—which are massive carbon sinks in their own right—the Gabriels practice what agroforestry specialist Eric Toensmeier, who contributed research to Drawdown, calls multi-strata agroforestry (#28 on the Drawdown list): thinning out maple stands he taps for syrup and clearing ground for stacking logs on which he grows shiitakes for area restaurants. This idyll—animals, trees, and forages working in tandem to fill a dual purpose of regenerating soil and climate and creating a sustainable, financially viable farm—belies certain challenges. According to Steve Gabriel, silvopasture’s fundamentals are well understood, but a lot remains unknown about how it functions in multifarious climates and soils with different combinations of trees and animals. “We’ve planted a lot of stuff, and a lot of it has died,” Gabriel says. On the other hand, failures have helped “provide a template for how we’re going to do the rest” of the land, and serve as teaching material for a growing number of mostly young farmers—the Silvopasture Facebook group reaches over 2,400 members—keen to farm this way. Having more demo sites like his own, as well as encouraging governmental and private investment in silvopasture, might create the necessary support to give more farmers a leg up, Gabriel thinks. Lesson number one: There’s no one-size-fits-all silvopasture model. Even the Gabriels’ modest acreage is replete with microclimates, each with its own quirks. The complexity increases as you radiate into ever-wider regions, further compounded by the needs and desires of individual farmers. For example, 14 miles south of their farm, the 69-acre Good Life Farm has had success with a peach and apple orchard grazed by beef cattle and poultry, supported by salad crops. About 180 miles east, in Valley Falls, New York, first generation farmers Dustin and Kassie Gibson have converted 20 acres of what Kassie calls “useless woodland” to silvopasture that supports beef cattle and hogs, thereby expanding the number of animals they’re able to support on their 70 total acres. And 115 miles south of the Gibsons, in Holmes, Meghan Riehl and Curtis Breuer are collaborating to get four acres of silvopasture plots at Grape Hollow Farm, a 47-acre vacation rental property, up and running. The thickly wooded, steeply sloped, and rocky property was historically used for sheep grazing, says Riehl, who finished a livestock apprenticeship at the Stone Barns Center for Food & Agriculture last year. Arriving at Grape Hollow, Riehl tended a small flock of meat-and-wool-producing Romneys. She ran them through one silvopasture plot; the others are currently too overgrown with low-bush blueberries and goldenrod that are unsuitable for forage. But “these plots could be made into something more than they are if we could thin them and clear them by bringing in hogs to lightly turn up the ground,” says Riehl. Not to mention, an expansion of the farm’s footprint, converting otherwise unusable land into pasture, as well as opening it up to firewood harvesting, and, as at the Gabriels’ farm, producing maple syrup and mushrooms. Riehl hopes this will help transition Grape Hollow’s one-tenth of an acre of scarce flatland devoted to vegetable crops, plus heritage chickens, “into a working farm that can fully pay for itself,” she says. Silvopasture requires rapt attention from farmers to ensure that the animals don’t cause destruction to the land by overgrazing it, and to young trees especially, by tearing at their bark and digging up their roots. But because it does not require costly “farmland” in order to produce food, tracts suited to the practice have often been neglected by generational farmers and can be had on the cheap. Connecting the dots between farmers and land is the aim of a new project at the NC Choices initiative at the Center for Environmental Farming Systems (CEFS) in Raleigh, North Carolina. The project is funded by a U.S. Department of Agriculture (USDA) beginning farmer and rancher grant; it will assist 15 farmers interested in raising pastured beef cattle, sheep, goats—and possibly hogs and poultry—in procuring long-term lease agreements on some of North Carolina’s 11 million acres of small, privately owned woodlots. “This is land that owners are already considering timbering. If they can get animals in to move through and do understory management, that’s a win-win—a service to the landowners, and farmers can get land-share opportunities,” says NC Choices Director Sarah Blacklin. She hopes to announce the first farmer/landowner pairings in early 2019. 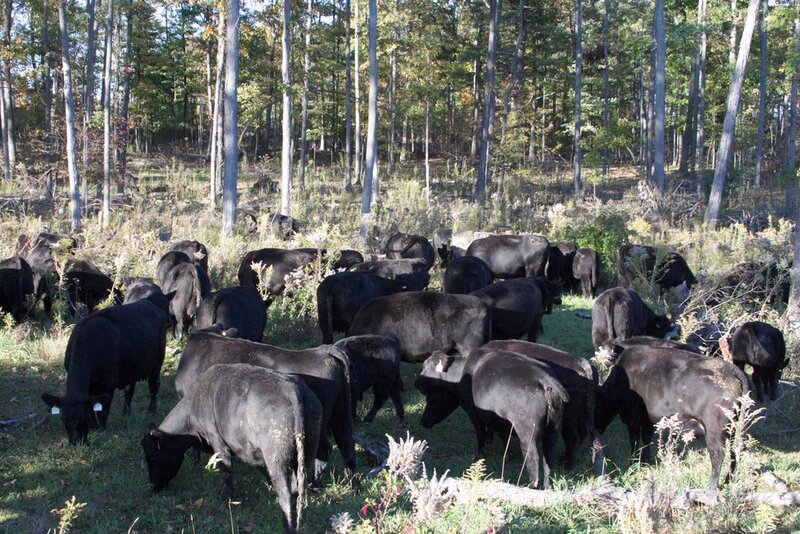 The project has benefited from ongoing research by ecologist Alan Franzluebbers, who manages a USDA silvopasture study in Goldsboro, N.C., where he’s been measuring the impact of animals on soil, forage quality, and timber production. “A lot of research needs to be done to quantify that,” he says. Local rancher Buron Lanier, who grazes cattle through his pine stands between timber harvests, has provided some useful data. Franzluebbers says Lanier’s silvopasture system potentially has greater soil organic matter than trees grown for lumber without livestock. And Lanier says silvopasture gives him “more fertile soils from manure deposits, in turn making the trees taller and the lumber more plentiful. Silvopasture science is ongoing, on Franzluebber’s study plots and elsewhere. At the University of California, Berkeley, conservation biologists Claire Kremens and Adina Merenlender are researching its benefits to species biodiversity (so far, positive). And back in Ithaca, the Gabriels are applying for a grant to test the nutritional quality of black locust trees as sheep forage. If the research continues to evolve, pathways—financial and otherwise—might open up for American farmers to try silvopasture on their own, or others’, unused acreages. That sounds like good news to Kassie Gibson. “It gives you such a feeling of accomplishment when you see that land used,” she says.